Pink/ White Guava Pulp: It is extracted from manually harvested, clean and ripe guavas. The processing includes cutting, de-stoning, refining, and packing. Pink/White Guava pulp is ideal for use in ice creams, desserts, smoothies, savory sauces, cakes, tarts, muffins, pie-fillings, etc. White Guava Puree Concentrate: Guavas undergo an exhaustive manufacturing process where the fruit is inspected, washed and blanched. The residue passes through a screw paddle which maximizes the pulp extraction. It is then heated and blended for a considerable time at a resistant temperature. IQF Pink Guava Dices: For IQF dices, the guavas are first washed, blanched, diced and individually frozen quickly by keeping them at a temperature of -18° C.
Frozen White Guava Pulp: It has natural sweetness and nutrients with no artificial preservatives with long shelf life and freshness. Frozen Guava Juice Concentrate: Clarified guava juice concentrate that is grit-free, clear and haze-free and manufactured from guava fruits from tropical North India. It is prepared by using enzymes to maximize the yield of a clear pure guava juice. The concentrate can be easily incorporated into jelly, fruit juice blend, baby foods, etc. At Shimla Hills, quality and deliverance have been a credo since the last 10 years. It hopes to delight its customers with the finest quality products, superior standards of packaging and at a competitive price even in the years to come. 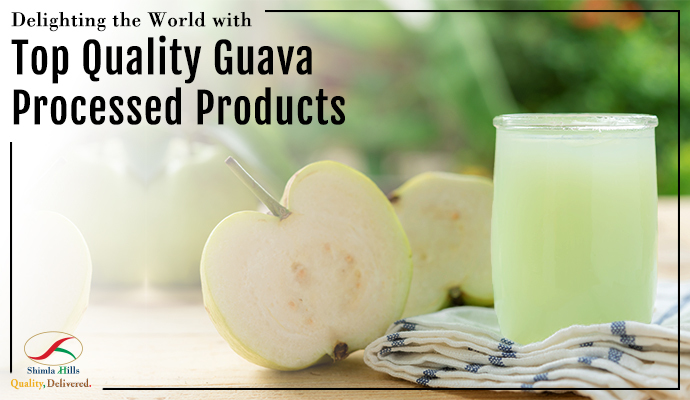 To get your hands on premium quality guava processed products, place your order with Shimla Hills NOW!